The term Anterior Shoulder instability refers to a shoulder in which soft-tissue or bony insult allows the humeral head to sublux or dislocate from the glenoid fossa. It is an injury to the glenohumeral joint (GHJ) where the humerus is displaced from its normal position in the centre of the glenoid fossa and the joint surfaces no longer touch each other. The glenohumeral joint (multi-axial spheroidal joint) is one of the largest and most complex joints in the body. It has the greatest range of movement of any joint, but this leaves it inherently unstable and with the highest chance of dislocation of all the body's joints. The GHJ is formed where the humeral head fits into the glenoid fossa, an irregular oval shape, which is an extension of the scapula, like a ball and socket, although only 25% of the humeral head makes contact with the glenoid fossa at any time. The acromion: a bony projection off the scapula. 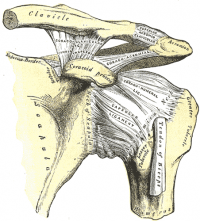 The coracoid process: a hook-like bony projection from the scapula. The rotator cuff; a collection of 4 muscles originating from the scapula (supraspinatus, infraspinatus, subscapularis and teres minor) which stabilise the GHJ and allow the wide range of motion. The labrum: a fibrous ring of cartilage which extends up from the glenoid providing stability in the form of a deeper cup for the humeral head to fit into. 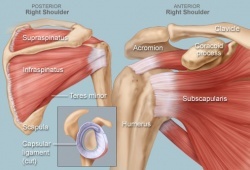 Anterior shoulder dislocations are much more common than posterior dislocations. Research suggests that incidence of recurrent shoulder dislocation is significantly higher in younger patients. The consequences of an initial anterior glenohumeral dislocation in patients over forty years of age are quite different than in the younger population, primarily due to the increased incidence of rotator cuff tears and associated neurovascular injuries. The anterior or posterior supporting structures of the shoulder can also be disrupted following an anterior dislocation. In the younger patient, anterior capsuloligamentous structures most commonly fail, whereas in older patients with pre-existing degenerative weakening of the rotator cuff, the posterior structures are more likely to fail. The GHJ is stabilised by both dynamic and static structures. The labrum: This concave compression mechanism plays an important role in the stability of the glenohumeral joint by maintaining the localisation of the humeral head at the glenoid against translational forces. The glenoid concavity is established by the glenoid shape, the glenoid cartilage and the glenoid labrum. The glenoid labrum increases the width and depth of the glenoid. Instability is increased with the size of the glenoid defect. The glenohumeral ligaments: The superior glenohumeral ligament functions primarily to resist inferior translation and external rotation of the humeral head in the adducted arm. The middle glenohumeral ligament functions primarily to resist external rotation from 0° to 90° and provides anterior stability to the moderately abducted shoulder. The inferior glenohumeral ligament is composed of two bands, anterior and posterior, and the intervening capsule. The primary function of the anterior band is to resist anteroinferior translation.. Excessive external rotation or over-rotation of the thrower’s shoulder is purportedly associated with the development of internal impingement syndrome (which occurs when the shoulder is maximally externally rotated and the intra-articular side of the supraspinatus tendon impinges on the adjacent posterior superior glenoid and glenoid labrum). Impingement syndrome is a potential precursor to anterior instability. Anterior instability accounts for 95% of acute traumatic dislocations. Dead-arm syndrome indicates pathologic anterior instability. It occurs when the arm is in an abducted and externally rotated position. 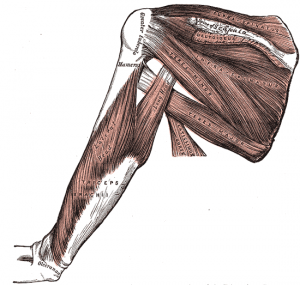 The patient complains of a sharp anterior shoulder pain and tingling in the hand and drops the arm suddenly. This syndrome is often seen in overhead sports, such as volleyball, tennis, swimming and water polo. Rotator cuff weakness, particularly in external rotation and “empty-can” abduction, is common in athletes with anterior instability. Bankart lesions are the most common consequence of traumatic anterior shoulder instability. Humeral avulsion of the glenohumeral ligaments is also a cause of anterior shoulder instability.. Diagnosis of anterior shoulder instability is through a thorough history, radiology and three specific tests carried out in this order: apprehension, relocation and surprise (release) test. According to Lo IK et al. these tests are highly specific and strongly predictive of traumatic anterior glenohumeral instability. A fourth test, the bony apprehension test, is similar to the apprehension test, but is used to diagnose instability with a significant osseous lesion component. GHJ instability can be categorised by the direction of instability, the chronicity, and the etiology. A thorough history and physical examination are essential. Age, activity level, sports participation, and hand dominance should be noted, as well instability in any other joints, especially the contralateral shoulder. Where a trauma is the cause of the symptoms, information about the position of the arm and the force of the trauma is noted. If this information is unknown, finding the arm position which reproduces symptoms is useful. The presence and quantity of previous shoulder subluxations or dislocations is also important to note. Information regarding all treatment prior to presentation should be ascertained, including any period of immobilisation or physical therapy and previous operative interventions. The characteristics of associated pain should be noted, however, the location of pain is not a specific indicator of glenohumeral instability. A distinction should be made between episodes of subluxation, or partial separation of the humeral head from the glenoid, and dislocation. Any associated symptoms including neurologic deficits and functional limitations should also be assessed . Age of the patient at the first dislocation is a key prognostic indicator. Patients under 20 years with shoulder dislocations have a 90% chance of recurrence, whilst patients older than 40 years only have a 10% recurrence rate, but are more prone to rotator cuff injuries. Patients who compete at a high level and/or in contact sports also have an increased risk of recurrence if the shoulder is treated non-operatively. Initial images taken are normally anteroposterior (AP) and axillary lateral views. If pain restricts the patient's ability to tolerate an axillary lateral view, a Velpeau view may be obtained in a semi-reclined, seated position. Further views that may be useful include: AP views with the shoulder internally rotated, a West Point view, a Didiee view, and a Stryker notch view. Hill-Sachs lesions are best viewed on AP radiographs in internal rotation and using a Stryker notch view. The Stryker notch view is obtained with the patient in the supine position and the arm forward flexed to 100° with the x-ray centred over the coracoid . An apical oblique view taken with the patient seated and rotated 45° and the beam directed 45° caudally is also useful for evaluating posterior humeral head defects. In cases of Bony Bankart lesions, recurrent instability can cause erosive or attritional loss of the glenoid rim causing progressive instability. Loss of 20% of the glenoid rim has been shown to cause significant recurrent instability and usually requires surgical correction of the bony deficiency. This deficiency may be seen on the axillary view and may be suggested by a break in the sclerotic line encircling the glenoid rim on the AP view of the shoulder. If further investigation is needed Didiee and West Point views can be considered. The Didiee view is obtained with the patient prone and the hand is placed on the ipsilateral iliac crest with the x-ray beam directed laterally at 45° to the floor. The West Point view is obtained in a similar prone position, with the shoulder abducted to 90° and the elbow bent with the arm hanging off the table. The x-ray beam is directed 25° medially and 25° caudally. Other imaging modalities such as CT and MRI are useful in clinical situations where the diagnosis is unclear. CT may be useful to demonstrate and quantify bony abnormalities including glenoid bone loss or fractures, glenoid version and humeral head abnormalities. Adding contrast and performing a CT arthrogram of the shoulder can also provide some insight into the status of the labrum, rotator cuff and ligamentous complex. MRI is extremely useful, and the preferred method to evaluate these soft tissues, however, it does not provide as clear a picture of the associated bony injuries. In the acute setting, the hemarthrosis resulting from the dislocation serves as an intra-articular contrast medium. In the more chronic setting, gadolinium-enhanced MRI is a useful modality to investigate for soft tissue pathology such as labral tears and capsular damage. In addition to Bankart lesions, an anterior periostial sleeve avulsion (ALPSA) or a humeral avulsion of glenohumeral ligament (HAGL) can occur with an anterior shoulder dislocation. These are associated with higher recurrence rates and if missed they can lead to higher post-surgical failure rates. HAGL and ALPSA lesions are best seen using MRI and MR arthrogram. Disabilities of the Arm, Shoulder and Hand (DASH) questionnaire: This is a 30 item subjective questionnaire which looks at the ability of a patient to perform certain upper extremity activities. Patients rate difficulty and interference with daily life on a 5 point Likert scale. This test can be performed with the patient in sitting or in supine. In sitting, the patient’s arm rests on the thigh with the examiner to their side and slightly behind. One hand is used to stabilise the scapula and the other is placed on the shoulder. The thumb is positioned over the posterior humeral head and fingers over the anterior humeral head. The humerus is loaded by pushing the humeral head into a neutral position within the fossa. Whilst maintaining the humeral head in this position, humerus is shifted forwards by applying an anterior force, to asses anterior instability. Some movement is normal, but should not be more than 25% of the humeral head. Grade 3 is present when the humeral head shows more than a 50% shift without spontaneous reduction and remains dislocated. A combination of laxity and a reproduction of the symptoms determines a positive or negative result. The patient is in a supine position, with the shoulder in 90° of abduction and maximal lateral rotation. A positive apprehension test occurs if the patient either looks apprehensive or resists further movement. To differentiate apprehension from other potential conditions, the relocation test is used. Start position is the same as that for the apprehension test, then an anterior-posterior force is applied to the shoulder to relocate the humerus in the fossa. The apprehension will decrease in the case of shoulder instability. The final test is the release test, where the posteriorly directed force applied in the relocation test is removed. The result is considered positive if the patient’s apprehension returns. The patient is in a supine position and the affected shoulder over the edge of the table. The patient’s arm should be relaxed. Position the arm in a combined midrange abducted position with forward flexion and lateral rotation. The stabilising hand is placed on the scapula so that the fingers and thumb secure the scapula at the spine of the scapula and the coracoid. The patient’s arm is pulled anteriorly to apply a gliding force to the glenohumeral joint. If an audible click is heard during the movement, the glenoid labrum may be torn, or the joint may be sufficiently lax to allow the humeral head to glide over the glenoid labrum rim. Analgesics can be used to decrease pain with the patient in a position of comfort while maintaining cervical spine immobilisation where necessary. A pillow is placed between the patient's arm and torso to further increase comfort. A non-operative rehabilitation program needs to be patient specific, based on the type and degree of shoulder instability present and the desired level of return to function. A rehabilitation programme can consist of a combination of any of the following: strengthening exercises, dynamic stabilisation drills, neuromuscular training, proprioception drills, scapular muscle strengthening and a graded return to the desired activities. Onset of Pathology: Pathological shoulder instability may result from an acute, traumatic event or chronic, recurrent instability. The goal of the rehabilitation program may vary greatly based on the onset and mechanism of injury. Following a traumatic subluxation or dislocation, the patient typically presents with significant tissue trauma, pain, and apprehension. Rehabilitation for the patient with a first-time traumatic episode will be progressed based on the patient's symptoms with emphasis on early controlled range of motion, reduction of muscle spasms and guarding, and relief of pain. Conversely, a patient presenting with atraumatic instability often presents with a history of repetitive injuries and symptomatic complaints. Rehabilitation for this patient should focus on early proprioception training, dynamic stabilization drills, neuromuscular control, scapular muscle exercises, and muscle strengthening exercises to enhance dynamic stability due to the unique characteristic of excessive capsular laxity and capsular redundancy in this type of patient. Degree of Instability: The second factor is the degree of instability present in the patient and the effect on their function. The rate of progression of the rehabilitation program will vary based upon the degree of instability and persistence of symptoms. For example, a patient with mild subluxations and muscle guarding may initially tolerate strengthening exercises and neuromuscular control drills more than a patient with a significant amount of muscular guarding. Frequency of Dislocation: The primary traumatic dislocation is most often treated conservatively with immobilisation in a sling and early, controlled passive range of motion exercises, especially with first time dislocations. Chronic subluxations, as seen in the atraumatic, unstable shoulder may be treated more aggressively due to the lack of acute tissue damage and less muscular guarding and inflammation. Rotator cuff and periscapular strengthening activities should be initiated while ROM exercises are progressed. Caution is placed on avoiding excessive stretching of the joint capsule through aggressive ROM activities. The goal is to enhance strength, proprioception, dynamic stability and neuromuscular control, especially in the specific points of motion or direction which results in instability complaints. Direction of Instability: Anterior instability is the most common traumatic type of instability seen clinically, where the humeral head is forced into extremes of abduction and external rotation, or horizontal abduction, the glenolabral complex and capsule may become detached from the glenoid rim. Concomitant Pathologies: Other tissues need to be considered that may have been affected as well as the pre-morbid status of the tissue. These concomitant lesions may significantly slow down the rehabilitation program in order to protect the healing tissue. Neuromuscular control: The sixth factor to consider is the patient's level of neuromuscular control, particularly at end range of motion. Activity Level: The final factor to consider in the non-operative rehabilitation of the unstable shoulder is arm dominance and the desired activity level of the patient. If the patient frequently performs an overhead motion or sporting activities such as a tennis, volleyball, or a throwing sport, then the rehabilitation program should include sport specific dynamic stabilisation exercises, neuromuscular control drills, and plyometric exercises in the overhead position once full, pain free ROM and adequate strength has been achieved. Patients whose functional demands involve below shoulder level activities will follow a progressive exercise program to return to full ROM and strength. Patients may be classified into two common forms of shoulder instability, traumatic and atraumatic. There are specific guidelines to consider in individualising the rehabilitation of each patient. The program will vary in length for each individual depending on the seven rehabilitation factors. During the early rehabilitation program, caution must be applied in placing the capsule under stress until dynamic joint stability is restored. It is important to refrain from pushing into external rotation or horizontal abduction with anterior instability. • Improve neuromuscular control of shoulder complex: PNF, wall stabilisation using a ball, static holds in push-up position on ball. This multi-phased program is designed to allow the patient/athlete to return to their previous functional level as quickly and safely as possible. Each phase will vary in length for each individual depending upon the severity of injury, ROM and strength deficits, and the required activity demands of the patient. Refrain from activities and motion in extremes of ROM however. • Improve neuromuscular control of shoulder complex: rhythmic stabilisation drills at inner, mid, and outer ROM, proprioceptive, scapulothoracic/glenohumeral musculature, PNF, weight shifts hand on ball, wall stabilisation drills. Shoulder instability may have a traumatic or atraumatic cause. The recurrence rate after primary shoulder dislocation is greatest in individuals less than 20 years old. Anterior instability accounts for 95% of acute traumatic dislocations. Diagnosis of anterior shoulder instability is made through history, radiology and the following three tests, apprehension, relocation and surprise (release) test, performed respectively. Rehabilitation should be based on an individual basis with consideration to the patient’s pre morbid state and level of activity. ↑ 3.0 3.1 3.2 Chen AL,Bosco JA. Glenohumeral Bone Loss and Anterior Instability. Bull Hosp Jt Dis. 2006; 64(3-4):130-138. ↑ 4.0 4.1 Araghi A, Prasarn M, St Clair S, Zuckerman JD. Recurrent anterior glenohumeral instability with onset after forty years of age: the role of the anterior mechanism. Bull Hosp Jt Dis. 2005;62(3-4):99-101. ↑ 5.0 5.1 5.2 5.3 5.4 5.5 5.6 5.7 Pope EJ, Ward JP, Rokito AS. Anterior shoulder instability - a history of arthroscopic treatment. Bull NYU Hosp Jt Dis. 2011;69(1):44-9. ↑ Rhee YG, Lim CT. Glenoid defect associated with anterior shoulder instability: results of open Bankart repair. Int Orthop. 2007;31(5):629-34. ↑ 7.0 7.1 7.2 7.3 7.4 Satterwhite YE.Evaluation and management of recurrent anterior shoulder instability. J Athl Train. 2000;35(3):273-277.